The Cope leader shook parliament today after alleging Ramaphosa wrote to the Special Branch in the 1970s saying struggle stalwarts had put communist ideas in his head. 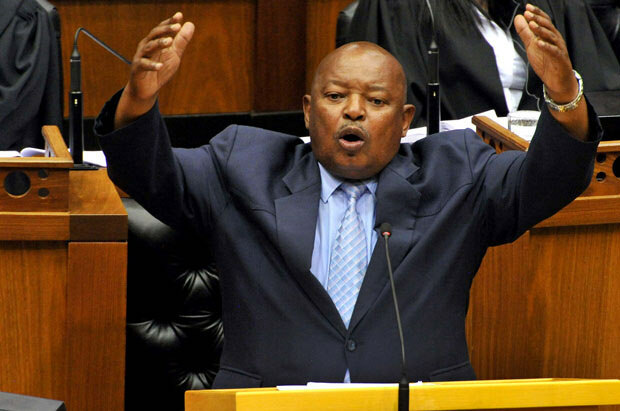 Congress of the People (Cope) leader Mosiuoa Lekota received a rare standing ovation from the EFF in the National Assembly during the Sona debate on Wednesday after accusing President Cyril Ramaphosa of selling out during the struggle in the 1970s. Lekota caused chaos when he stood to present his contribution to the debate after refusing to speak in Ramaphosa’s absence, saying he needed to respond to the president’s invitation to a “trip” he had extended to the Cope leader on Thursday during his Sona. Cope leader Mosiuoa Lekota receiving a standing ovation from Julius Malema and the EFF in Parliament during Debate on President’s SONA Address. “The president addressed me when I was here. I want to answer some of the things he said to me,” said an adamant Lekota, who was criticised by stand-in speaker Thandi Modise for his “amnesia”. “You now amaze me. From 1994 you have been sitting on these benches. You do know that during the Sona … this amnesia is amazing. The president or any other minister is just a human being, They do have a chance to go out and come back. Since 1994, you and I are witnesses that in fact there were instances where the presidents would not even be here. He’s got staff here, he’s got deputies, he’s got ministers and people who will take notes and keep him updated when he comes in,” said Modise. EFF national spokesperson Mbuyiseni Ndlozi stood up and accused Lekota of “holding the house to ransom”. “His time is up. Woza, chief, this side,” said Ndlozi. Then when Ramaphosa made his way back to the House, Lekota caused such waves that he compelled EFF leader Julius Malema to offer his party’s allocated eight minutes to Lekota to finish his “important” speech about Ramaphosa’s alleged selling out. Lekota turned down Ramaphosa’s invitation to a “trip”, saying the only trip he had wanted to go on with him had taken place in the 1970s when those in the struggle were sent to Robben Island to be imprisoned for their political beliefs. Lekota was imprisoned on the island in the 1970s. He said: “I want to say to you, Mr President, that we were invited on a trip to the struggle by the leader of the students of our time, the late Steve Biko, who said to us that we must fight the struggle and said that ‘in case of danger or living conditions that threaten human life, we must accept life for what it is or not at all’. “It did not take very long, two years or so, because it was in 1972. In 1974 we went into detention, among others, and in the course of that we had to respond to this challenge. You invited me last week, we had to respond to that challenge, your invitation last week was late. “The challenge we had to respond to was [at] that time, and you, with us in detention, when it was difficult. You wrote to the Special Branch [police] that we put communist ideas in your head. In doing so, you condemned us to the Special Branch. I say this to you because the Special Branch rewarded you … and they sent you home, and we headed to Robben Island. Lekota then received a standing ovation from the EFF and some DA MPs.